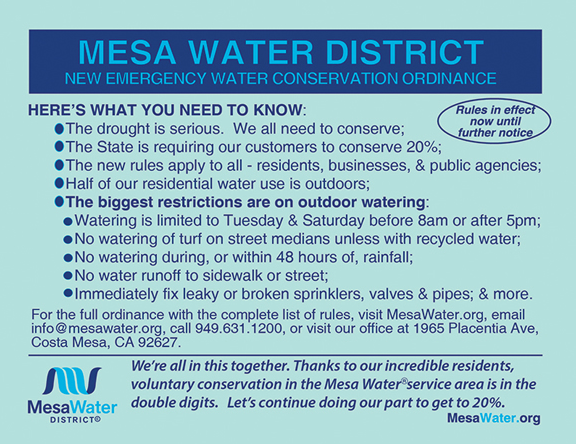 As mentioned in an earlier post, the Mesa Water District Board met last night before a standing-room-only crowd at their headquarters and voted unanimously to pass the New Water Conservation Ordinance. The vote was 4-0 because President Shawn Dewane was absent - he was at the Orange County Water District Board meeting for their vote on the Poseidon Desal issue. He's the past president of that board, too. According to sources within Mesa Water District, the ordinance as proposed was tinkered with by the Board - some necessary fine-tuning to help the District meet the 20% water use reduction mandated by the State of California. The new ordinance is being modified from the draft document discussed last night and should be available for public observation early next week. When that happens I'll write about this subject again. In my earlier post I provided a chart of the levels of conservation and the details of the Conservation Program in an easy-to-use format. That chart is now out-of-date, so I'll provide you with the new version next week, when it's available. 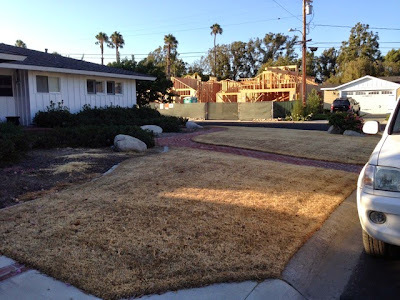 In a nutshell, Mesa Water wants us to cut outside use as much as possible. The new ordinance restricts landscape watering to only two days each week - Tuesday and Saturday - and not within 48 hours of a rain event. 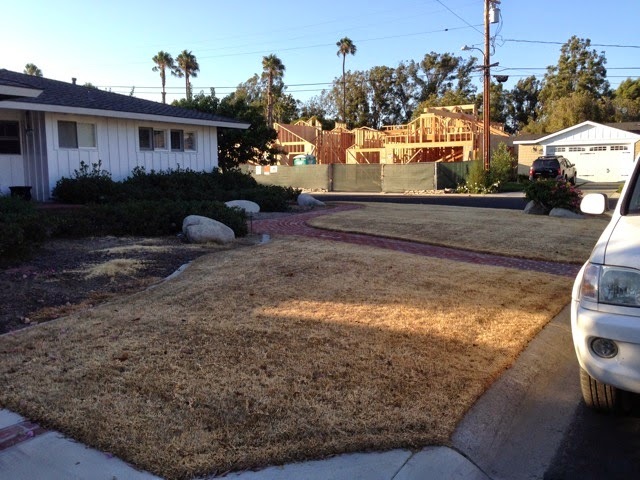 The ordinance was considered an emergency ordinance, so it is in effect NOW, which means you may not legally water your lawns and planting areas until Tuesday, and only if you must at that time. Penalties - Warnings with the possibility of water flow restrictor or disconnection of service. YES, THEY WILL CITE YOU! And, no... they are not going to be sending the "Water Gestapo" out to cite you. However, if it comes to their attention that you're violating the rules, you will be warned, and warned - per the above. And, if you continue to thumb your nose at this crisis, it will begin to cost you in your wallet. So, despite the recent rain, we all must do our part to conserve water. The state says we must save 20%... that's doable. 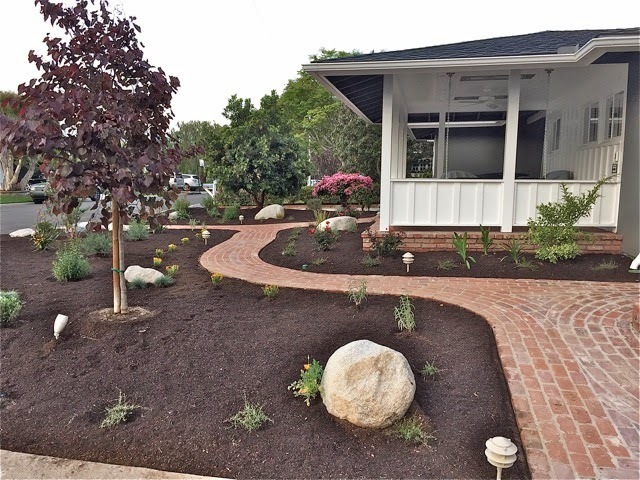 My sweet and very patient wife and I decided to replace our 1,500 square feet of lawn with a water-wise landscape plan, which we just completed. 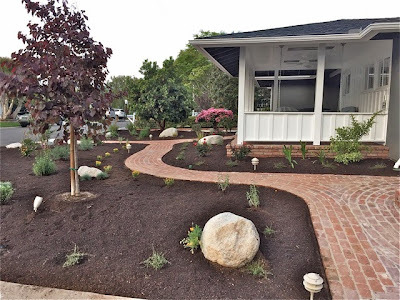 Yeah, OK, we added a porch, too, which took too long for us to take advantage of the rebates from the water district on replacing turf with other plantings - but YOU CAN! Read about that program HERE. This is what it looks like now. 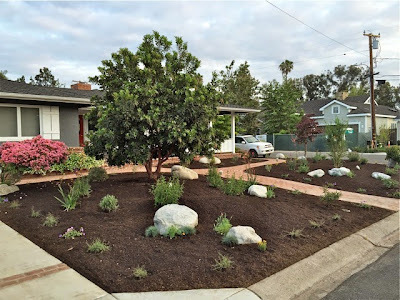 A year from now - maybe sooner, depending on how those drought-tolerant plants respond to the loving we're giving them - it will look very different after those plants fill in. Geoff, that is really nice. They did a great job. The porch is a great addition. geoff, thanks for sharing your photos! it's beautiful.